It’s usually nice to be noticed. But when the attention is coming from blog content spammers, you may feel a little differently. The rapid growth of pageviews of this blog (on track for ~4.5M views in 2014) has coincided with an ever-increasing volume of comment spam, those irritating blog comments that promise you $79/hour working from home!, Dior fashions at low prices!, and the best lawyer in Podunk! Currently I’m receiving over 250 comments like these a day, so I’m happy to pay Akismet $60/year for their Pro Blogger service that almost perfectly throws them into a spam folder. I say “almost perfectly”, because Akismet doesn’t handle a rarer form of comment spam, trackback spam, where spammers put links to your content onto a page they want people to visit. 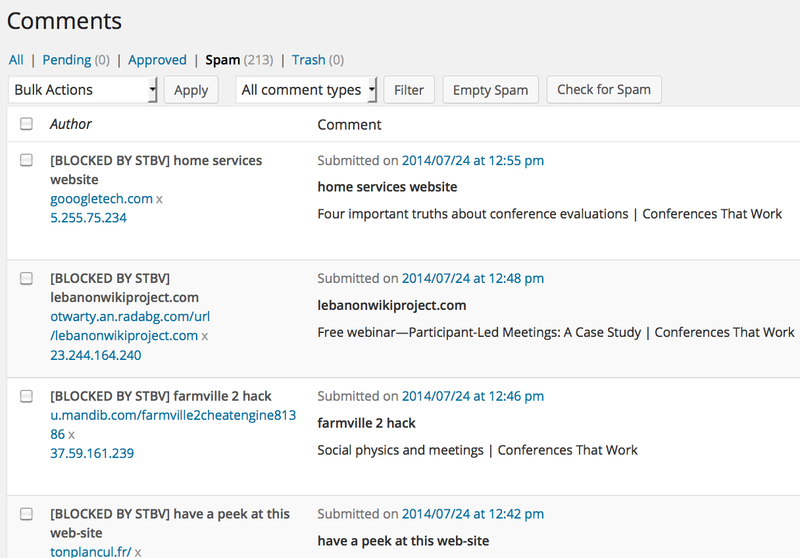 Trackbacks can be a useful way to see who is linking to your content, so I don’t want to ignore every trackback link. Unfortunately this means that you have to look at every trackback and manually move spam to the spam queue, an irritating multi-step procedure in WordPress. I started seeing increasing quantities of trackback spam over the last few months, so I’ve added a plugin Simple Trackback Validation with Topsy Blocker that seems to be doing a good job automatically moving trackback spam to the spam queue. One more observation. Looking at the spam comments I think that besides bloggers like me who have to spend time and money keeping this crud off their posts, there’s another victim of these sleazy attempts to plaster low-quality SEO slime over the internet. I notice lots of spam links to small obscure businesses, and I wonder how many of them are being fleeced by jerks who promise to increase traffic to their website, the business owners never knowing that the fleecer is spraying comment spam to make those stats rise.